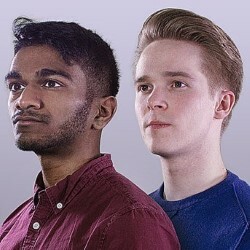 In Cahoots are a sketch duo (Paul G Raymond and Luke Manning) who provide an easy hour of comedy and a few things to think about afterwards. Their energy is uplifting and takes us on a dazzling tour of worldwide locations including a TV studio in India, a palace in Nigeria and a desert in North Africa. Thematically speaking, some of the sketches are set in traditional funny-land but there are all sorts of sketches which take the audience just a little bit out of their comfort zone – we like that! Their lightness of touch manages to combine thrusting intelligence with endearing silliness. The stand-out piece for me is the scene where a drunk young buck takes a taxi with a Muslim taxi driver. They strike up a delightful friendship while talking about their dramatically different lives. The high comedy of the scene provides classic belly laughs yet virtually no one else is doing material like this. Paul and Luke simply ignore 21st century social taboos and perform unfettered universal human comedy. The overall writing is strong but with more experience, they will crack the tipping point between clever and funny to perfection. This makes for an act to watch now and in the future. We’ll be back.